Italian painter. His early training is thought to have taken place in the Carracci academy in Bologna and with Agostino Carracci, during the latter s years in Parma in the service of Ranuccio I Farnese (1600-02). 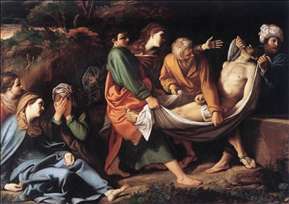 Following Agostino s death, Badalocchio and his fellow pupil Giovanni Lanfranco were sent to Rome, where they assisted Annibale Carracci on the decoration of the Galleria Farnese and the Herrera Chapel in Santa Maria di Monserrato, Rome (1602-07; now Museo del Prado, Madrid, and Museu Catalunya, Barcelona). Badalocchio s first independent, signed work is an etching after the antique statue of the Laocon (1606). The following year, together with Lanfranco, he published a series of 51 etchings after Raphael s frescoes in the Vatican Logge. Annibale s death in 1609 precipitated Badalocchio s return to Emilia. 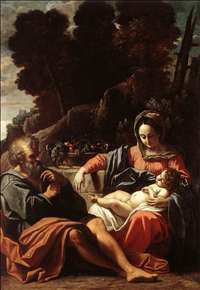 There in 1613 he created his most important work, the frescoes in the cupola and pendentives of San Giovanni Evangelista, Reggio Emilia, a reinterpretation of Correggio s work in the church of the same name in Parma. During the years 1614-17 Badalocchio was again in Rome. Under the influence of Lanfranco, with whom he collaborated on several projects, including the decoration of the Palazzo Mattei di Giove (1615), Badalocchio adopted a more vibrant treatment of light and a freer application of paint. Frescoes with mythological subjects in the Palazzo Verospi, Rome, and the Entombment, a nocturnal scene painted on copper (Patrizi collection, Rome), probably also date from this period. Though overshadowed by his colleague Lanfranco, Badalocchio is recognised today as one of the artists responsible for spreading the innovations of Roman Baroque to northern Italy. 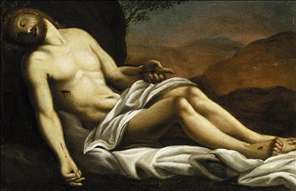 See more details about "The Dead Christ"